The Nelson Paint Company creates pesticide product for use in Hawaii! KINGSFORD - After more than six years of product development, Nelson Paint Co. of Kingsford has registered two pesticide licenses with the state of Hawaii Department of Agriculture and the U.S. Environmental Protection Agency for .68 caliber herbicide filled projectiles designed specifically to eradicate invasive plant species in the state of Hawaii. Nelson has also been granted sole source supplier status with the state of Hawaii Department of Land and Natural Resources and the University of Hawaii, and is producing herbicide projectiles for the U.S. Army, National Park Service, U.S. Forest Service, Maui Invasive Species Council, Kauai Invasive Species Council, and the Nature Conservancy. HBT was invented with the singular purpose in mind of delivering strictly controlled amounts of herbicide to invasive weed species to protect and rehabilitate native plant populations. 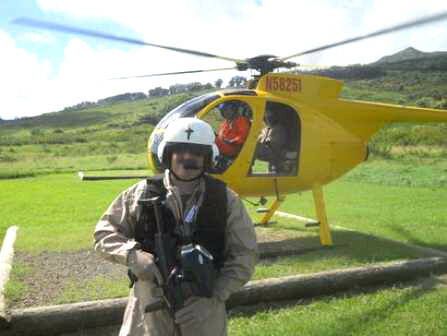 Applied from the ground or by helicopter with readily available commercial paintball equipment, the process is extremely effective in targeting and eradicating select invasive plants. "Until now, elimination of invasive plants in Hawaii's steep mountain topography and dense jungle has required workers to rappel down 1000 foot cliffs to eliminate one plant, then re-ascend, reposition a few feet away, and then repeat the process for the next plant, or utilize a helicopter spray ball to kill everything in a 30 foot diameter area", said Rick Louys, president of Nelson Paint Co.
"Both current processes pose a high safety risk to workers and pilots, and often result in collateral damage to native plants. Also, endangered species plants are often co-located near the invasive species, which makes the current methods unsuitable. With Nelson's HBT technology, weed management specialists are now able to treat and eliminate individual plants on steep canyon walls using paintball guns with surgical precision, greatly increasing the safety of weed elimination and allowing a 100-fold increase in the number of weeds that can be treated in the same amount of time." "This is important to the State of Hawaii because over 80 percent of the plants growing there are invasive, and they grow and reproduce faster than the state, local, and federal weed management agencies can eliminate them utilizing the standard technology." By utilizing Nelson's proprietary, nontoxic, biodegradable encapsulation formula, adverse environment impact is non-existent. Invention of the projectile, refinement of the manufacturing process and perfection of the encapsulation formula has taken years of testing and development by Nelson. Meticulous attention to detail in all these processes by Nelson in concert with field testing jointly conducted between Rick Louys from Nelson and Dr. James Leary of the University of Hawaii has led to the success of the HBT project. "Additional noted advantages of applied HBT include 60 yard or more effective range with sub-meter accuracy, accommodation of application to traditionally inaccessible steep terrain with slope grades between 15 to 60 degrees and greatly reduced amounts of herbicide placed in the environment due to the surgical accuracy of targeted applications," Louys said. Both the University of Hawii and Nelson Paint Co. see HBT as today and tomorrow's most effective and low cost solution to the ever growing problem of defending native plant populations while leaving a positive environmental impact on all fronts. Product and application process have been tested with unprecedented success and collective approval in diverse habitats throughout the U.S. resulting in existing and emerging worldwide business opportunities. Pilot programs to expand the HBT program are currently underway in 12 other States across the United States, with strong interest from Australia, New Zealand, and other Pacific Rim Countries. "This project has required thousands of man-hours from Nelson and the State of Hawaii and other agencies, and has taken several years to achieve commercial success. It is one part of our long-term business plans to continue to diversify our business. I am proud that we have been able to achieve success in the pesticide industry, where the oversight is extremely rigorous, the failure rate of applications for registration are high, and projects like this evolve in years, not in months," Louys added.